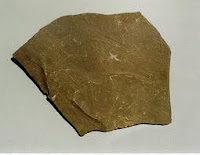 Shale is a fine-grained sedimentary rock composed of mud that is a mix of flakes of clay minerals and tiny silt-sized particles of other minerals, especially quartz and calcite. The typical color is gray. 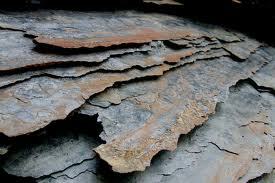 The process in the rock cycle which forms shale is called compaction. 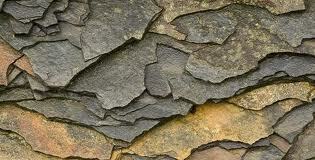 The fine particles that compose shale can remain suspended in water long after the larger and denser particles of sand have deposited. Shales are typically deposited in very slow moving water and are often found in lakes, in river deltas, on floodplains and offshore. They can also be deposited on the continental shelf, in relatively deep, quiet water. This process would have taken millions of years to complete. 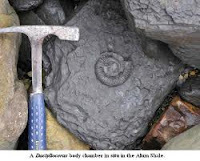 Fossils, animal tracks and even raindrop impact craters are sometimes preserved on shale bedding surfaces. 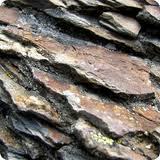 Shales that are subject to the heat and pressure of metamorphism alter first into slate. 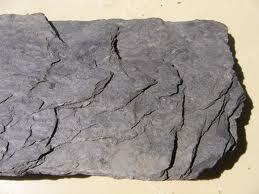 With the continued increase in metamorphic grade, the slate then becomes schist and finally it will become gneiss.